Sponge cake roll with a chocolate spread, a light cream, topped with toasted almonds and coconut flakes. 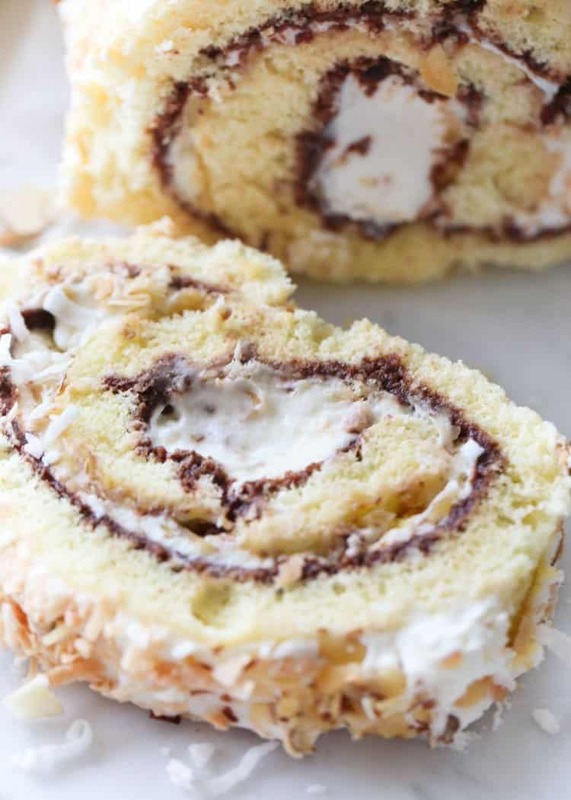 This Coconut Almond Swiss Roll is a great dessert for any occasion. Try this Chocolate Roulade with Strawberries. 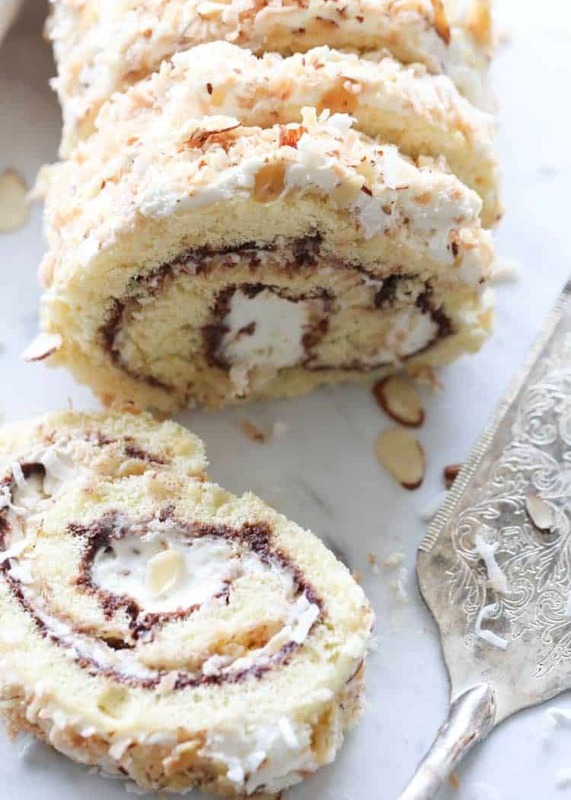 This almond coconut swiss roll is such an easy recipe to make, and it tastes phenomenal. With five kids, I really don’t have time for dessert recipes that take a whole afternoon to prepare. You will want to use a large, rimmed baking sheet the size of 18″x12″ (somewhere in that vicinity). Then toast the almonds and the coconut shavings. Following prepare the cream for cake. Lastly, assemble the swiss roll. This recipe was inspired by the candy Almond Joy and that really is what it tastes like in every bite. You have the chocolate, the coconut flakes, the almonds and to top it off – a delicate light cream. We love the homemade chocolate layer that takes this cake over the top. I mean, who doesn’t love chocolate!?! 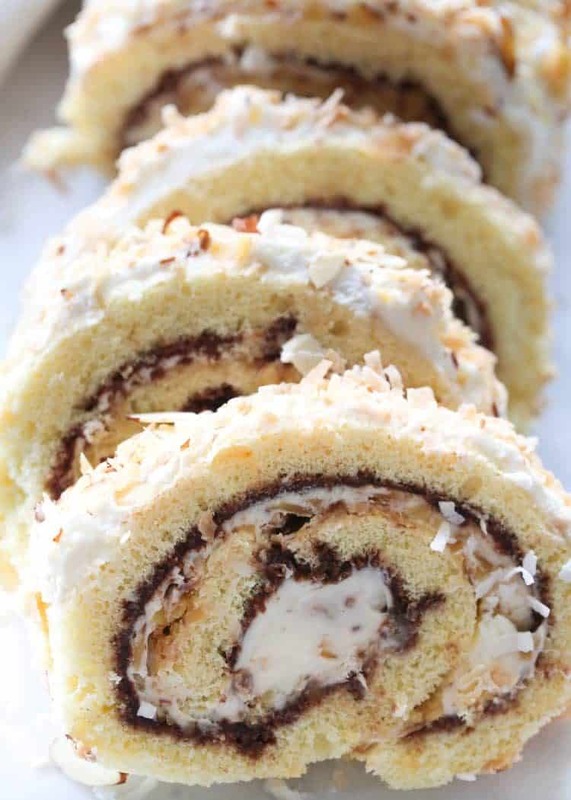 The light chocolate layer is such a great compliment to this coconut swiss roll. This coconut roll cake is the perfect dessert. The cake is perfectly balanced in every bite. This cake roll is great to make it you are just looking to spoil the Mr. You really can’t go wrong with this recipe. The kind of batter used for this swiss roll is a sponge cake (aka biskvit). Biskvit is a popular cake batter used in the Russian and Ukrainian kitchen. There are many different ways to make and assemble biskvit batter! Layered Cake with Raspberries– Layered sponge cake with a dulce de leche cream topped with raspberries. Tiramisu Berries Cake Roll Recipe– Inspired by Tiramisu cake. This sponge cake roll with coffee for the soaking, soft cream and topped with fresh berries. Layered Cake with Almonds and Coconuts– This swiss roll was inspired by this recipe. Coconut Almond Swiss Roll made with sponge cake roll with a chocolate layer, a light cream, topped with toasted almonds and coconut flakes. Preheat oven to 355°F. Line baking sheet with parchment paper. Spray with baking spray and lightly dust with flour. Set aside. Spread sliced almonds on a small baking sheet. Spread coconut flakes on a baking sheet. Bake 5-7 minutes until golden in color. Set aside to cool. Separate egg whites from egg yolks in two bowls. Beat egg whites on high speed for 2 minutes, until whites form soft peaks. Slowly, add sugar and beat another 2 minutes until stiff peaks form. Using same whisks. In a different bowl, beat egg yolks and sour cream for 1 minute. Add yolk/sour cream mixture to egg whites and beat on low speed until combined. Combine flour and baking powder. Add half the flour to egg mixture. Beat. Add the rest of the flour and beat again. Beat lightly and just enough to incorporate flour. Don't overbeat. Pour mixture into the prepared baking sheet. Bake 12-14 minutes. Check the middle of cake for the readiness with a toothpick, it should come out clean. Once baked, let cool about a minute. 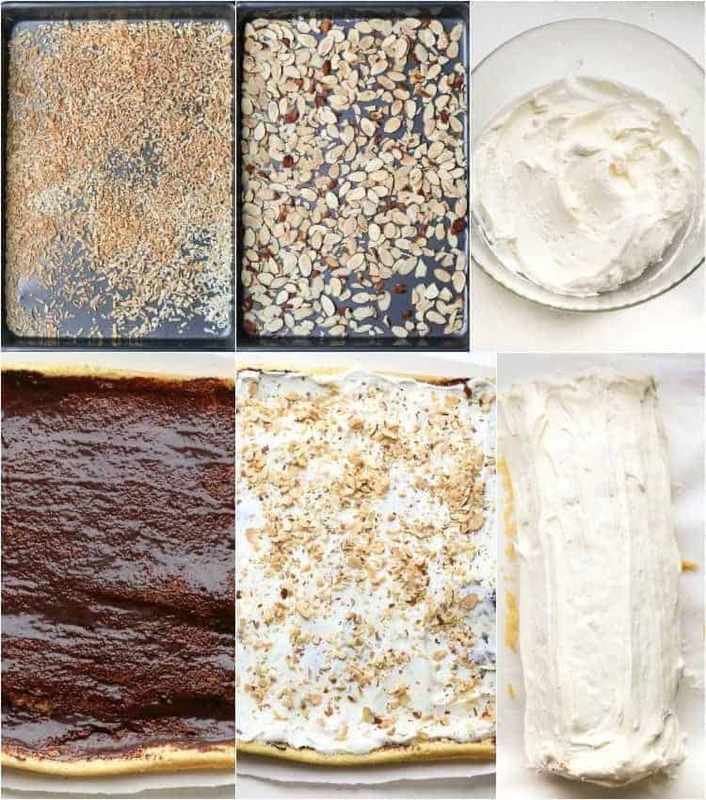 Remove parchment paper from the bottom of the cake and put it on top and roll it up. Let it cool completely. (Kitchen towel can be used instead when rolling into the roulade. Chocolate layer. Add all of the ingredients for the chocolate in a saucepan. Cook on medium heat, stirring frequently until everything is a thick smooth consistency. Set aside to cool. 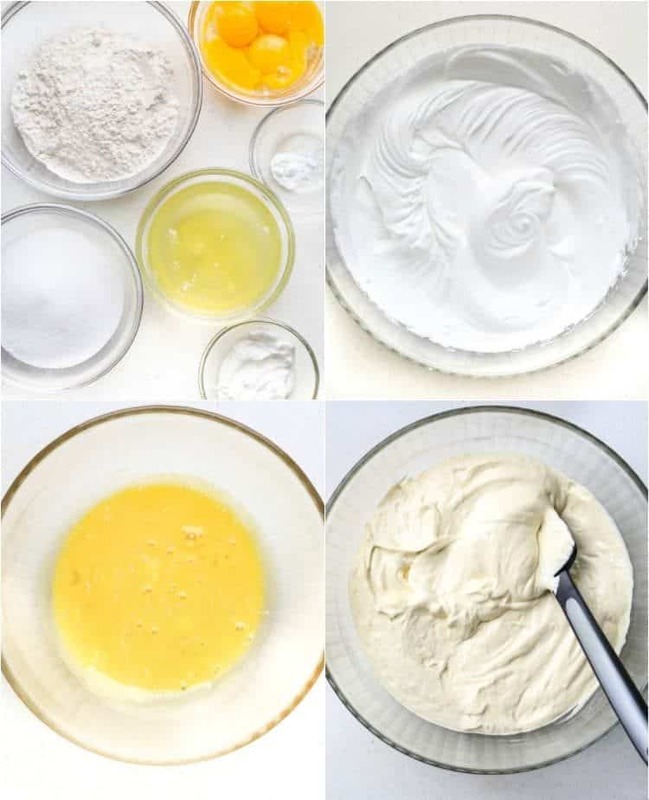 Prepare cream: With a mixer, beat the cream cheese until smooth, add sugar and mix until combined. Refrigerate until needed. In a separate bowl beat the whipping cream until solid and soft peaks form. Combine with cream cheese and sugar, fold in the whipping cream until well combined. Carefully unroll the cake roll and remove parchment paper. Spread the chocolate generously over the cake. Add about 2/3 of the cream over the chocolate. Tightly roll the roulade. Coat top and sides of roulade with remaining cream. Decorate top of roulade with toasted coconut flakes. Refrigerate cake covered at least 2 hours or overnight. Wow, this cake was delicious!!!! Thanks so much for trying our recipe, Oksana! What size of baking sheet for the cake? Also, sweetened or unsweetened coconut? How do you make the chocolate spread? ?